In large shallow baking dish (such as 13 X 9 in./3 L), whisk together the eggs, milk, garlic powder, dry mustard, chili powder, ½ tsp (2 mL) salt and ½ (2 mL) tsp sugar. Place bread slices into egg mixture, turning them to fully soak. In large non-stick skillet, heat 2 tsp (10 mL) olive oil on medium heat. Working in batches, cook bread to brown bottoms only, 1 to 2 min., first. Then sprinkle (top sides) with cheese, flip over to brown. Repeat steps for all toasts; keep warm in oven. Wipe out skillet; add remaining olive oil; bring to medium-high heat. Add tomatoes. Sprinkle with pepper, remaining salt and sugar. Cook until skins begin to blister, 1 to 2 min. Stir only occasionally to avoid breaking up tomatoes. Sprinkle with parsley. Remove from heat. 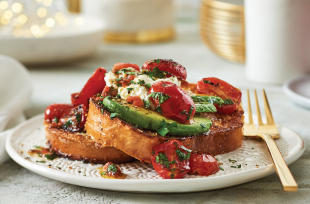 Divide bread slices onto 4 plates, top with avocado slices and spoonful ricotta per serving. Spoon tomato mixture overtop.